In Wise Guys, Ken Evans explored the significant role fathers and men have on us and how the lack of a connection with a father is hurting our youth and even adults. The statistics in this book stated the lack of fathers results in, “likely to abuse drugs and go to prison, twice as likely to drop out of school, seven times more likely to become pregnant as a teenager”, and much more. Throughout the book, Ken Evans looked at the role key men figures had on his life and how they helped to shape him into the man, father, and husband that he needed to be. He begins the book by sharing how his parents went through a divorce when he was a teenager. He began to see a family therapist, Weldon C. Fuller. This men role model in his life had a remarkable impact on his life. Ken was deeply afraid of becoming his father and how he acted in the divorce. Fuller shared with Ken that we have to be extremely careful about trying to become the un-something. He stated that Ken needed to, “stop trying to not do this or not be that. Instead find some men, who have the life you want, and figure out why their situation is the way it is. Then do some thinking. What is it that makes these guys worth imitating? What do they have or embody that you want? Learn from them and then model yourself after the parts you like.” (Page 25). This was a critical introduction to how Ken Evans chose to model this in his own life and how he wrote this book. I would recommend this life changing book to all men who is ready to change their lives. I loved how Ken Evans asked men to make a list about who they wanted to be in five years and to pick twelve character traits that they want to display. Some of my traits that I want to display is hardworking, courage, integrity, and much more. I immensely enjoyed all the different stories he shared throughout the book in order to encourage men to find wise guys in their own lives that can assist them into becoming a better man, husband, and father. I like how he shared how he met his wife and how he came into a relationship with Christ. I really connected with the concept of the book and how important it is in learning and demonstrating vital character traits that other men are portraying in their life. This book can greatly benefit men, and it would make a wonderful father’s gift or even a graduation gift! For guys, more than ever, it’s a confusing world. Your GPS doesn’t offer any maps showing how to get to the point of wisdom — and who likes asking for directions anyway? But there are ways to get that guidance you need. The answers may be all around you, in the form of guys you already know. Wise guys. More experienced guys. Better-traveled guys. Could there be ways to tap into their invaluable knowledge without enduring dull lectures or taking pages of notes? Kent Evans has surrounded himself with these wise guys. They have shown him all the back roads on the way to wisdom. With a great deal of humor and an endless supply of stories, he wants to show you how to gather life-enriching truth from the guys in your own circle. KENT EVANS is the board chairman and co-founder of Manhood Journey, a ministry that helps fathers and mentors build the next generation of godly men. Kent has personally experienced how the guidance of godly men can change the course of a life. Today he is blessed with a solid 20-year marriage, four wonderful sons and a fulfilling life – largely because of what he’s learned from other men. He lives in Louisville, Kentucky, and can be found on Twitter @manhoodjourney. In Hunting Hope, Nika Maples explored the topic of discovering hope in the mist of life’s unexpected storms. She shared how at the young age of twenty how she endured a stroke that made her unable to walk and speak. She never thought she would have to go through this major challenge. In this book, she was able to find hope again. She shared how God was with her through it and how He is able to restore joy and bring back the light in your eyes. She also included how Biblical characters endure through their difficult times and how we can learn a lot from them. My favorite chapter was the one entitled, “He Will Carry You”. In this chapter, Nika revealed how she struggled with being single and how people view you differently when you’re “unattached”. She told the personal story of deciding to attend a young married class at church. Most of her friends were in the class and she was told by the leader, “to come back when she had a ring on her finger”. This was heartbreaking to her and I personally see nothing wrong with a single person attending a marriage class when they are unmarried. I believe single people need to hear about where other married people are struggling and dealing with. I understand how some may not agree with that because some may be afraid that the single person might try and take their spouse. But if they are both actively working towards having a strong marriage and providing what the other spouse needs and wants, they shouldn’t have to worry about someone else trying to take their spouse. It was also tough to read about how when Niki was almost fortieth a lady at a Bible study asked her to lay hands on her daughter and pray for her. This lady’s daughter was 27 and she was still not married yet. I connected with this chapter because I’m 26 and still single and not really going on dates and I have only been in one relationship that I knew that was bad for me. I loved how she shared what single people go through. People are constantly trying to fix me up too and they all end badly. I connect with how Nika had a desire to have a child. I also have the same desire and I have considered adopting at some point. But being a single man, the odds are against me. It was comforting to read the story about the two men moving the piano and she related this back to how God is able to carry our burdens and how He is mighty enough to be our strong tower. I would recommend this life changing book to anyone who is in need of some hope today. It’s so easy to lose our joy and hope for the future when life doesn’t go according to “our” plans. I love how she shared how God came through for her and how she was able to regain her hope after enduring a stroke. I really related to her and her struggles with being single and not really dating much. It’s was nice to know, I’m not the only one who has been let down and hurt by church members. I’m glad she shared how hunting and pursuing hope has increased her joy and help her to discover her purpose. I liked how she included tons of scriptures and Biblical stories in order to encourage readers to not to give up until they reach their promised land! This book has immensely helped to find my hope and joy again, if you’re losing hope, then go ahead and read this amazing book! Nika Maples became a hope hunter after suffering a massive brainstem stroke that left her quadriplegic in her twenties. Doctors warned that she had as little as 48 hours to live, and---if she lived at all---she would never walk or talk again. There was no hope on the horizon. So Nika started to hunt for it. Today, she not only walks, but she speaks to audiences everywhere about the power of hunting hope when a situation appears hopeless. She says hope remains camouflaged in the daily mundane. If we are not looking for it, we will miss it, though it is right before our eyes. Whether you or someone you know is going through a situation that feels hopeless, you will find encouragement in Hunting Hope. Whether you are experiencing a medical trauma, a financial hardship, or a relational crisis, you will find empowerment in Hunting Hope. As you read, you will cling to 20 truths about God's character and practice 5 daily disciplines that will develop your own character in crisis. You will become a hope hunter. Maybe it doesn't matter what causes suffering in our lives as much as it matters what suffering causes in our lives. Maybe we were all meant to be hope hunters. Nika Maples is the author of Twelve Clean Pages, the memoir of her survival of lupus and a stroke that left her quadriplegic at age 20. After learning to walk and talk again, she became a public school teacher, winning 2007 Texas Secondary Teacher of the Year. She holds an MA in English Education from Columbia University and currently is pursuing an MDIV from The King's University. When she is not traveling to speak, she lives, writes, and laughs as much as possible in Fort Worth, Texas. At twenty, Nika Maples learned that when hope was all she had, she claimed it boldly while defying all odds to recover from a devastating stroke. The lessons from that struggle are powerful and universal, and she shares those lessons in her new book, Hunting Hope. Doctors warned that she had as little as 48 hours to live, and—if she lived at all—she would never walk or talk again. There was no hope on the horizon. So Nika started to hunt for it. Today, she not only walks, but she speaks to audiences everywhere about the power of hunting hope when a situation appears hopeless. She says hope remains camouflaged in the daily mundane. If we are not looking for it, we will miss it, though it is right before our eyes. Celebrate the release of Hunting Hope with a $200 Getaway Giveaway (details below) and a live webcast with Nika on May 26! Enter today by clicking the icon below. But hurry, the giveaway ends on 5/24. The winner will be announced at the Hunting Hope live author webcast on 5/26. RSVP for a chance to connect with Nika and other hope hunters, as well as for a chance to win other prizes! RSVP today and spread the word—tell your friends about the giveaway via FACEBOOK, TWITTER, or PINTEREST and increase your chances of winning. Hope to see you on the 26th! 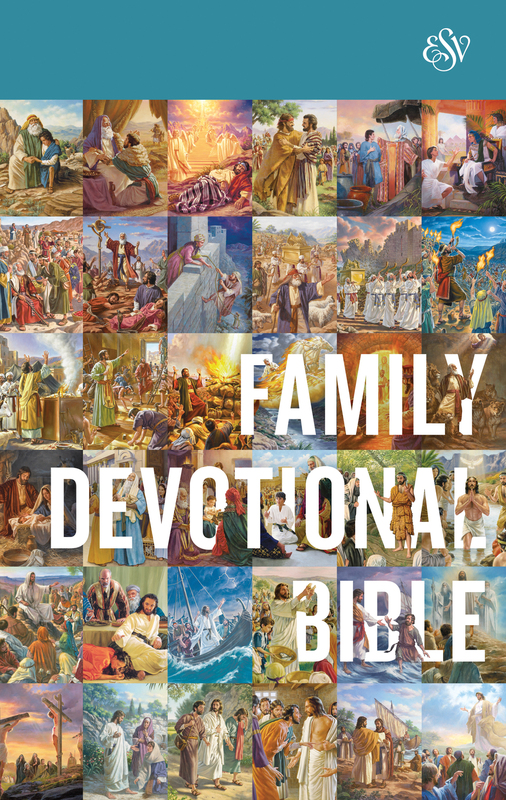 ESV Family Devotional Bible is a brand new family devotional Bible by Crossway. This devotional contains beautiful cartoon illustrations throughout the Bible in order to showcase a scene from scripture. The devotional shares a story describing an overview of a passage. It includes questions for you to answer together as a family. There is also a helpful key verse to remember and this would make a great activity for your family to do together. The Bible had very nice maps in the back of the book showing the Biblical locations where readers can easily understand the areas better. I would recommend this awesome Bible to anyone who is seeking a new family Bible. This Bible's translation is very easy to understand and it will help introduce young readers to the teachings of Jesus. I liked how the devotional were written to help children and your family in diving deeper into the passages. I liked how the questions were written in order to start a discussion among family members. I loved all of the colorful illustrations and I especially enjoyed the ones for "The Fiery Furnace" and "Jesus Calms the Storm". Kids will really enjoy and benefit from having an image to relate to the scriptures. If you’re looking for a new devotional Bible, then get this one! The ESV FAMILY DEVOTIONAL BIBLE is a hardbound colorful Bible. It retells 130 key stories from the Bible with full color illustrations for each story, as well as placed within the Bible text where it is found. The stories are simplified and easy for children of all ages to understand. The ESV Family Devotional Bible is designed to help families read and apply God’s Word together. This full-color edition features the complete ESV text interspersed with engaging illustrations and gospel-centered devotions related to key Bible stories—guiding families through the entirety of God’s Word over the course of a year. Each devotion also includes discussion questions and suggestions for additional reading, helping families develop a habit of reading the Bible together and applying its truth to all of life.